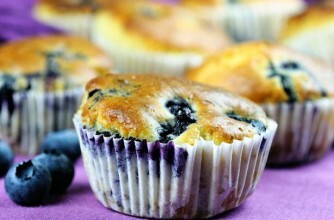 These are a good and easy alternative to shop-bought muffins. They are bursting with real fruit rather than artificial flavours. By using a suitable vegetable oil you can make sure that they are free of saturated, trans and other less healthy fats as well as avoiding the salt found in most margarines. You will need a muffin tin, well-greased or lined with paper cases. Preheat the oven to 220° C, Gas mark 7. In a large bowl combine the flour and sugar. Make a well in the centre. In a separate bowl or jug combine the milk, eggs, oil. Add this mixture with the blueberries and orange rind to the dry ingredients. Gently mix together until all the ingredients are only just combined. Be careful not to over-mix – it should look like a lumpy batter. Divide the mixture between the muffin cases. Bake in the pre-heated oven for about 15–20 minutes or until well risen and lightly browned. Remove the muffins from the tin and leave to cool on a wire rack. They are best eaten the same day but can be kept for a couple of days in an airtight container or, alternatively, freeze well. Cook’s Tip: Frozen berries can be used if fresh are not available. You may like to try some other varieties such as raspberries or blackberries. You can also use lemon rind or a teaspoon of vanilla essence instead of the orange rind if you prefer.